Unused features blur the focus of LibreOffice, and maintaining legacy capabilities is difficult and error-prone. The engineering steering committee (ESC) collected some ideas of what features could be flagged as deprecated in the next release – 5.4 – with the plan to remove them later. However, without any good information on what is being used in the wild the decision is very hard. 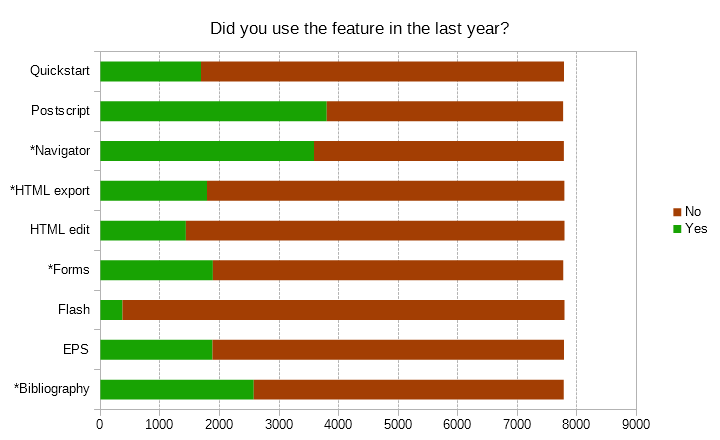 So we run a survey in the last week to get insights into what features are being used. In the last year, I added at least once an encapsulated postscript image (EPS) to my document using Insert > Image > Filter, or the like. In the last year, I have exported the content of a presentation or drawing to the Macromedia flash format (*.swx) using File > Export… > Filter at least once. In the last year, I have used at least once the HTML editing capabilities of LibreOffice started per File > New > HTML document along with the web preview and the HTML source view. In the last year, I used the Postscript printing at least once, which is enabled per Tools > Options > Print > PDF as standard off. In the last year, I have used the quick starter (Tools > Options > Memory > LibreOffice Quickstarter) at least once to speed-up the launch process. We also added a few distractor questions of features that should be used more often (Navigator) or are of interest (Bibliography) to conceal the expected No to all questions above. I have used the inbuilt bibliography tool at least once in the last year to manage my references. In the last year, I have added form controls, for instance checkbox or push button, into my document to access values from a database. In the last year, I have exported my document to HTML using File > Export > Filter as XHTML at least once. In the last year, I have used the Navigator (F5) at least once to get an overview of my document or to organize the content. The order of the questions was randomized. As of today we have received 10,449 replies in total with about 1/3 of no answers, i.e. people who just take a look at the survey and closed it directly. Thanks to the awesome localization team we were able to run the survey in various languages. 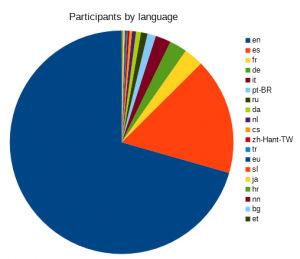 Without a big surprise English was the most relevant language followed by Spanish, French, German, Italian, etc. The survey consisted of simple Yes/No questions with the expectation of a very low number of “Yes, I have used this feature in the last year” except for the distractor questions. The result in figure 2 reveals another picture. Figure 2: Results from the survey (raw data can be downloaded). The hypothesis was that most users do not use the features, except the distractor items. But the result baffles us. In average 25% report using legacy functions. Really surprising is that almost 50% do actively switch off to the options ‘PDF printing’ in order to get Postscript. Given that we do not only address Linux users, it would also include a large number of Windows and macOS users where Postscript is completely irrelevant (and therefore a No was expected). As a simple validation, all participants were filtered out who answered solely with No or Yes. But the pattern remains as it is, meaning the answers were deliberately done. Another surprisingly often-used feature is HTML editing started via ‘New: HTML document’. It’s hard to imagine that someone edits HTML directly nowadays (there was another question about export as HTML, which was never subjected as deprecated). We have two different interpretations of the result. First, the target group of surveys like this might be heavily biased due to the platform where it is announced (Planet LibreOffice, OMG! Ubuntu, Phoronix etc.) not only because of the focus on Linux, but also because people who read those news sites might be more expert than the average user. Alternatively, participants may have just glanced over the questions and answered Yes to Postscript, for instance, as a known thing, not taking into account that PDF printing is the default since a couple of years. Putting all together we decided to not flag any of these functions as deprecated yet. That’s definitely not good since it costs maintenance effort and reduces stability. Too many unused features have also a negative impact on usability. Another learning is that we need to get real user data, like requested in the tender some years ago. Nonetheless, the data from this survey gives us some overall impressions and can help us to create further surveys in the future. What do you think about the results? Something that crosses my mind is that, as you point out the target audience are (perhaps) expert IT users. BUT, Libreoffice is an application that has facilities more often used by “average” users – office and admin / clerical staff who may not be “IT experts” or web / graphic designers. Perhaps it may prove useful to undertake a broader survey by adding the request to the download page for a long(er) term study. Consider using FB / Twitter to recruit a broader range of average users. unfortunately, survey respondents tend to be self-selecting. The only way to get real answers is to incorporate some metrics collection in the product. But then, we have to ask if users are happy to allow data to be exported, and again it would be a self-selecting group who answered. I felt the narrative on the survey could have been improved, maybe with descriptions of how and why such features were introduced, and whether the requirements for them are now superceded. Every item appears to have less than 50% of respondents using it. Most seem to be less than 30%. Perhaps a follow up survey asking if the user would switch to a different office suite if the feature was dropped would show that almost no one who uses the less popular features would drop LO. If that proved to be the case then those obscure features could be dropped to save resources and increase stability. It would be really easy to misread the above as asking whether people printed/exported their documents to a PDF file. It’s also not clear whether the question is asking about printing to a Postscript file, or whether this would also involve removing Postscript support for printers. +1. I found question about Postcript unclear, at least because Menu texts were not correct. Question about Navigator was also wrongly understood: some people thought it was speaking about Navigator outside Sidebar, with View > Navigator, so they answered ‘no’ even if they currently use Navigator in Sidebar. I confirm this one, I think I (probably) misread the question and answered is as it was for pdf. The wording of the Postscript question was just quite bad. I read it twice and I ticked yes, because I use the default setting “Print > PDF as standard off…”. Thus, I ticked the wrong answer as you suggest from your summary of the survey. And, indeed, I use the HTML editor to see Libreffice generated content in the HTML editor to copy part of the document as html syntax. Certainly, Flash export was pretty low. Since the web is moving away from Flash due to security and performance concerns, I would say it should merit the chopping block if any feature does. As for editing raw HTML, yes, I do it every day. But I’d never use LO for that purpose. For years I used Gedit, but now use Atom. I would think most web developers or anyone editing raw HTML regularly would be more likely to do so with a proper code editor than use an office suite. I was surprised the number was so high. I’ll second the sentiment that the PS question was really bad. I had to read it three times to make sure I was answering correctly. (yes, I have used PS printing in the last year) I wouldn’t say it is something I need frequently, but it has allowed me to obtain proper output on more than one occasion. I’ve also used it because a printing company preferred it over PDF. The question is based on the actual option. So the result is also an indicator to change the checkbox “[x] PDF printing” with an unclear alternative state into radio buttons like “(o) PDF ( ) Postscript”. The HTML question was also poorly worded. If someone has used “File > New > HTML document” but not used the “File > Preview in Web Browser” AND the “HTML Source” View, should they answer yes or no? What if they used LibreOffice to edit an existing file instead of creating a new one? Does it apply to someone has just used the “Web” view (vs. “Normal” or “Full-screen”)? It would be nice to see some sort of analytics, statistics function in LO. E.g. a simple counter that counts how often a user uses a certain function. Add a random id that identifies the installation and ask the user to anonymously upload the report. That would be much more valuable and it would make sense to have the data, so we can adapt UX and UI by how often something is used. So this also means no-one ever applied for the 2015 tender? If the budget is still there, maybe the tender could be renewed? Also it would be nice to see follow up reports on the Tenders. They are announced with a blog post, but one never hears from it again aftwerwards. I feel this should rather be gathered via opt in directly in LO. About quick starter – this is a very handy component, especially on weaker computers used as “typewriters”. Unfortunately putting it in the survey while it is impossible to use it on Linux (used to replace WinXP on these computers), is manipulation and results of this question should be modified to remove Linux/LO versions share from it as Linux users can’t use the launcher. This is a common democracy-related manipulation – you can, but you can’t. I have to recommend one thing, as a LO user since few years. The quick starter is definitely a good thing, especially on older computers used as “typewriters”. It allows to minimize startup waiting few times. These computers usually are migrated from WinXP to some light Linux and starting LO from scratch takes few minutes on them. So starting them once at boot, with Quick starter, saves lots of time. The problem is that since version 5 this quick starter doesn’t work on Linux at all. I’m interested how real results of Quick starter survey are, excluding Linux users who can’t use Quick starter. I don’t like such democracy manipulations like “you can but you can’t” as too many people get caught on them. What I wish for is a LaTeX support in the Math Equation Editor. Why to develop something from scratch and not use LaTeX? Is it possible to intergrate WebKit to support HTML?